Independence Day is Coming…Are You Ready For Picnics? 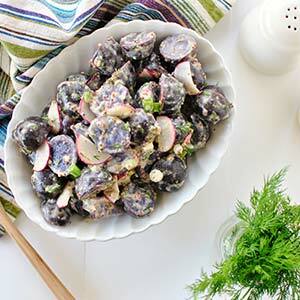 There are lots of ways to make delicious potato salad from Share-Life Farms’ purple potatoes! Bring a large pot of water to a boil. Once boiling, season with a heavy pinch of sea salt and add in the purple potato halves. Cook for 15 to 20 minutes or until fork tender. Pour the potatoes into a colander that is set into a sink to drain and cool. In a large bowl combine the Greek yogurt, vinegar, Dijon, garlic and lemon pepper. Whisk until smooth. Continue whisking while slowly pouring in the olive oil. Add in the chopped fresh dill and stir to combine. Once the potatoes have cooled completely, toss them with the dressing along with chopped green onions and sliced radishes. Keep refrigerated until ready to serve. Enter your email address to get Share-Life Farms news & alerts by email.